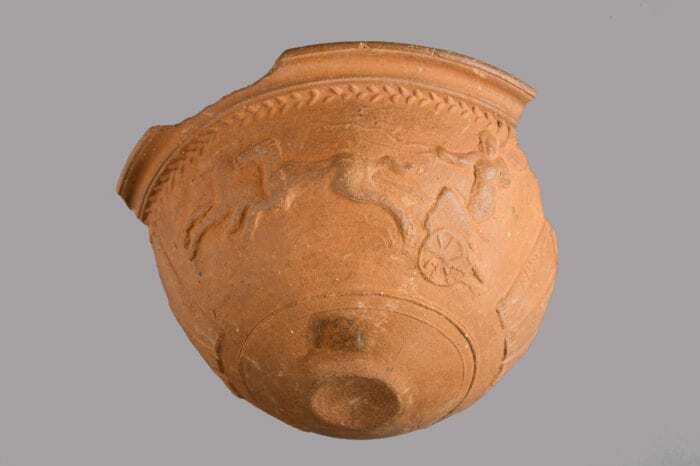 This fragment of a bowl depicts a chubby cupid figure, or putto, driving a two-horse chariot. Three tall, triangular turning-posts, or metae, on either side of the chariot set the scene in a Roman circus. The putto extends a long whip over the two leaping horses, perhaps encouraging them to go faster against another racing putto on the other side of the bowl, now lost. Note that the metae are decorated with several registers of small, geometric designs and are adorned with garlands. 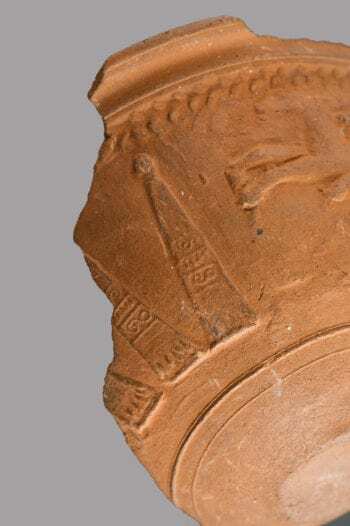 There is a laurel-leaf band in a herringbone pattern visible below the rim, as well as ridges encircling the bottom of the vessel, perhaps markings from the molding process. Laurel crowns were traditional prizes for victors in athletic competitions; here they may reinforce the competitive nature of the scene.